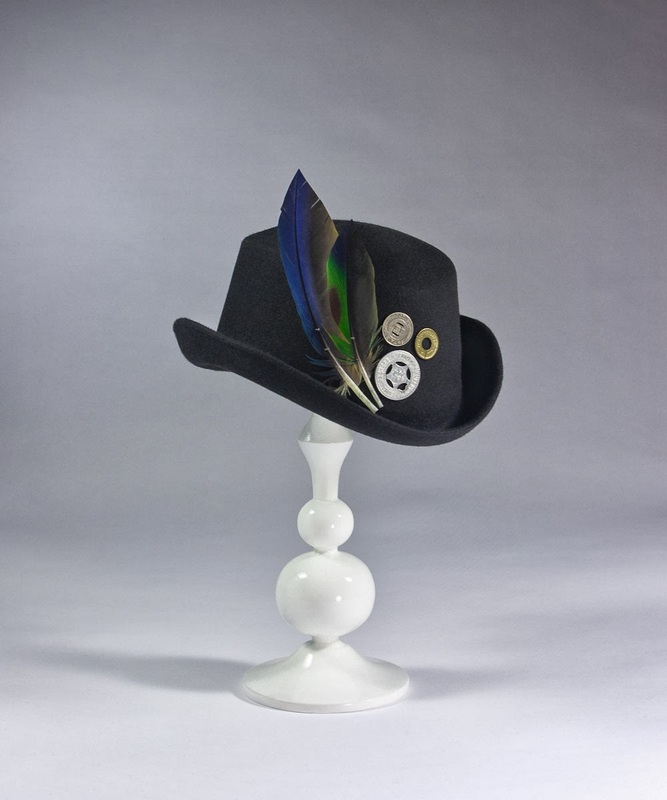 Another brand new shape for Fall / Winter 2013: The 'Jesse' riding hat. 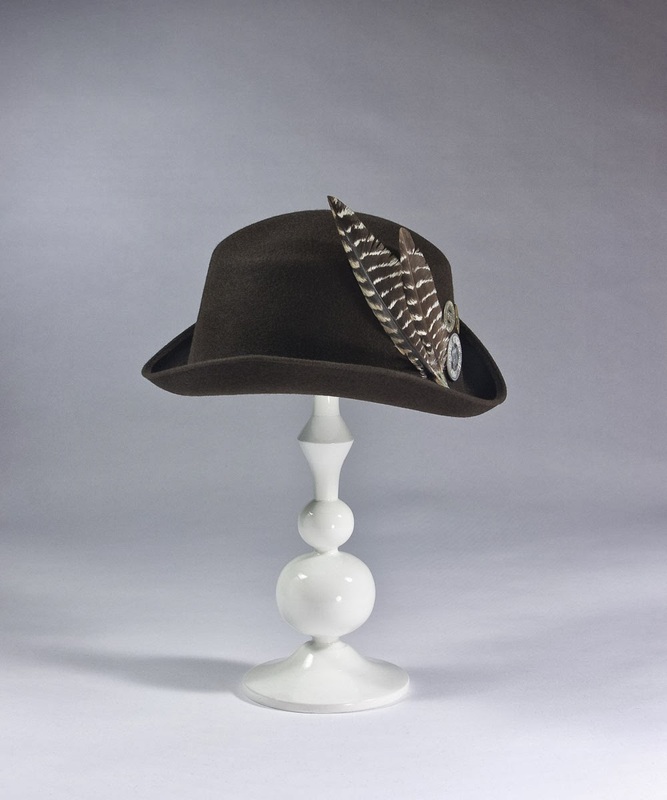 This soft riding hat has a low crown paired with a curvaceous brim that dips down flirtatiously over the forehead. 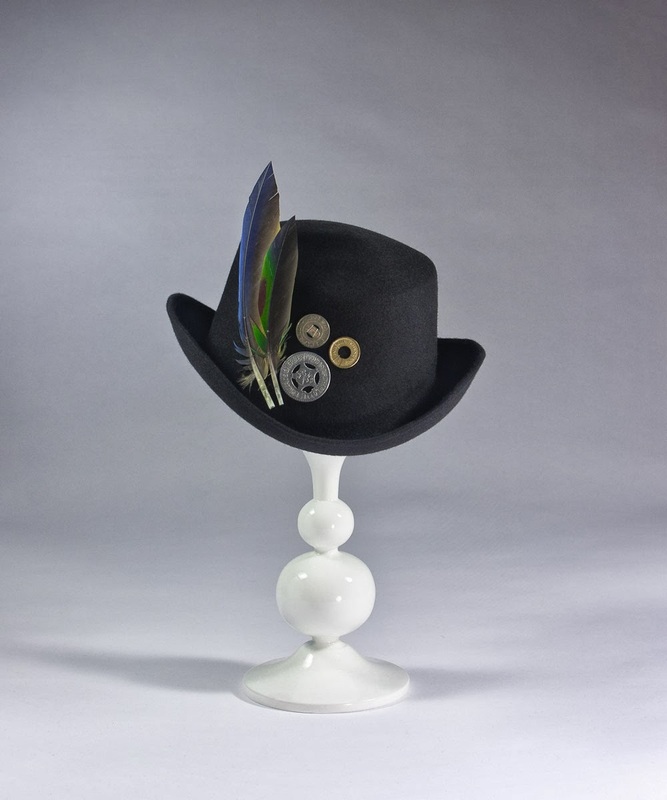 The overall shape is something between a top hat and a bowler, and the deep upside-down ' U-shape of the brim hugs the head as it perches slightly on top. Trimmed with three vintage engraved metal coins (transit, 'amusement' and good luck tokens), and two feathers. Comes with a ribbon sweatband. Offered in two colors to start. This is chocolate brown with brown and white striped turkey feathers. The second color is charcoal gray, with blue / green parrot feathers. Each feather in my collection is different, so the exact colors and patterns on them will vary, making each hat a unique item. I've been buying feathers from an incredible aviary in Oregon that has rare and beautiful birds. The birds there have a really nice life, are housed in no-cruelty conditions, and all the feathers are harvested when the birds molt naturally (or when, sadly but inevitably, they die of old age or natural causes). The aviary has a special license to have these birds and sell their feathers. Because of the way they're collected, the feathers are in short supply and only available twice a year, very limited and special. Due to trade restrictions and to comply with US law, I'm able to sell these parrot feathers to customers within the US only (i.e. no international sales). I'll be writing another blog post soon to profile the aviary soon with more information on their business. 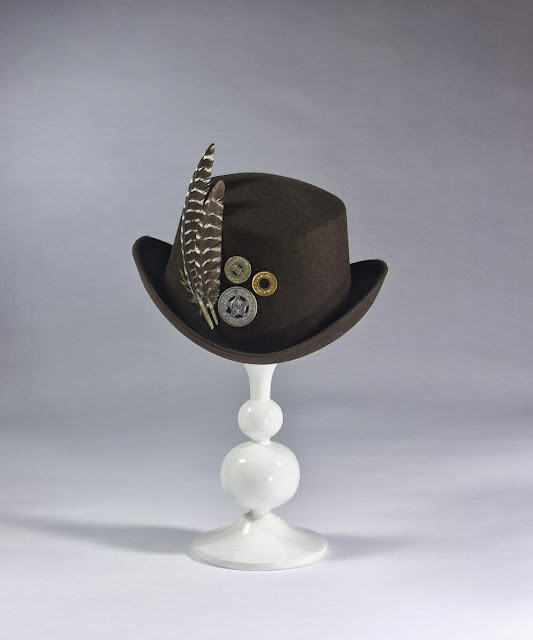 The chocolate 'Jesse' is available now in our Etsy shop. If you would like to purchase the charcoal one, please contact us directly to arrange the order.